Please SEE Part 1 before you read this list! 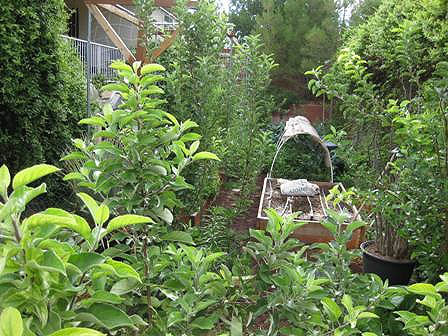 Here is what a young Food Forest can look like in a part of your urban yard! Linda’s List is intended for a Mediterranean climate like coastal Southern California has, one of only 5 in the world. The list in your area may be different. Check out your local gardeners’ successes, check with your local nursery. This list is not tree specific yet. We’re working on that! More than a list of plants, Linda’s List gives tips for good growing, eating, and usage! Once our fruit trees are planted in their water-saving basins in a budding Mediterranean food forest, it’s now time to think about what else to plant in these usually moist wells and swales. Or up the trees? Or nearby? We need these companion plants to increase our food and medicine yield, and also to enrich the soil, provide habitat, pull up minerals and other nutrients from deep in the earth, draw nitrogen from the air and bring it into the soil, attract beneficial insects to control pests, create shade for delicate roots — and to provide beauty, a critical psychological and spiritual yield in every garden. Thanks to the members of the Permaculture Guild of Santa Barbara and the Santa Barbara Organic Garden Club for their ideas and input. Additions and corrections are welcome. Please email lbuzzell@aol.com. Especially welcome would be input on what plants do best under specific fruit trees – so far I don’t have much information on that. Cane berries. Upright cane berries are fun to pop in here and there as understory plants and they take some shade. But we found out the hard way that you probably don’t want to put in sprawling, thorny berries (especially blackberry) that sucker underground – they pop up all over the yard and are hard to eradicate. When we buy new berries we limit ourselves to thornless varieties and our current favorites are ‘Navajo’ and ‘Apache,’ although the thorny varieties that still linger in our garden – and will probably be there for hundreds of years as they’re ineradicable – taste best. So we live with them and enjoy the berries. Elderberry. Shrub. There is a California native variety. Produces edible fragrant white flowers (used to make elderberry syrup and wine) and edible small blue berries that the birds love. Ripe berries are safe to eat but leaves, twigs, branches, seeds and roots are toxic. Has medicinal uses. We use our elderberry as a sacrificial plant attracting birds away from other fruit trees. Lemonade Berry (native). Rhus integrifolia. Can also control erosion. Placement of these may take special care, as you don’t want to plant them too close to delicate tree roots. Edible canna. Canna edulis –Achira. Flowers are smaller than most cannas and the root is edible, can be chopped and sautéed like potato. EDIBLE FLOWERS (note: most fruit trees, veggies and herbs also have edible flowers. Always triple check the safety of any flower before eating! Daylilies. Hemerocallis species. Buds are used in Chinese stir fry, Petals in salad. Nasturtium (flowers, young leaves and buds that may be pickled like capers) Let the plants die back in place. They will reseed and form a straw mulch. Lemon verbena. A drought tolerant shrub with delicious leaves for tea. Mint. Some fear its vigorous, spreading roots, but we welcome it into drier areas as ground cover, autumn bee food and a source of fresh leaves for cooking and tea. Guava. Psidium Tropical shrubs native to Mexico, Central and South America that yield white, yellow or pink fruit. Not to be confused with Pineapple Guava (Feijoa) Psidium guajava (apple guava) is one tasty variety. Also try lemon guava and strawberry guava. Artichokes. Plant away from tree roots, in baskets as the gophers love them. Brassicas like broccoli, kale, collard greens. Dandelions. Leaves are great in salads and so good for us. Small birds like the seed heads. Fava beans and other beans. We often forget about vertical space in the garden, but it’s nice to increase your yield by growing edible vines up fruit trees, on walls and over arbors, fences and hedges. Passion Fruit. A garden member says “mine is simply rampant, productive and trouble-free; gets little to no supplemental water.” The juice can be used to make a spectacular salad dressing (served at Los Arroyos on Coast Village Road in their tropical salad). Bamboo. Use clumping instead of running kinds to avoid it taking over your garden. Bamboo shoots are a delicacy in Asia. Sacrificial plants. In permaculture designs we often plant trees, shrubs and other plants that are nitrogen-accumulators, “nurse” plants or fruit-providers for animals that might otherwise eat our crops. When they have performed their function, we “chop and drop” them around our fruit trees as a nutritious mulch. Yucca. We’ve read that yucca yields edible fruit and flower buds. Anyone have more info on this? Ceanothus. Shrubs and ground covers that fix nitrogen in the soil. Salvia, ornamental. These are treasures in the Mediterranean forest garden. Tagetes lemmonii. Golden color is lovely in fall. Easy-to-grow succulents can provide temporary ground cover for delicate roots. They can act as a living mulch until other plants take over that function. This crop is often free, as gardeners who have ground-cover sedums always have too many and are glad to share. Pelargoniums and lantana are other easy, colorful ground cover that can be removed as needed. #1 Home Permaculture book in the world for seven years! Per PatternLiteracy.com, Toby Hemenway’s home site, Gaia’s Garden has been the best-selling permaculture book in the world for the last 7 years. The enlarged, updated 2nd edition is the winner of the 2011 Nautilus Gold Medal Award. The first edition of Gaia’s Garden sparked the imagination of America’s home gardeners, introducing permaculture’s central message: Working with nature, not against her, results in more beautiful, abundant, and forgiving gardens. This extensively revised and expanded second edition broadens the reach and depth of the permaculture approach for urban and suburban growers. Treat yourself and your land to this incredibly efficient way of gardening. Wisely use ALL the space available to you in a good way. Nature is the Master Gardener – follow her lead.